A group of Santa Teresa Parishioners meet every Thursday 10:00am-11:30am (except during the month of August and the last three weeks in December). in the Santa Teresa Conference room between the Church and the Chapel. 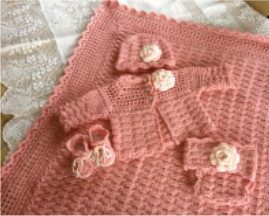 The purposed of the group is to knit, crochet or quilt baby items that are distributed through Santa Teresa Pantry and the Layette Program of the Diocese of San Jose. New members welcome.